The campus of Mount Vernon has changed significantly over the last few years with expansion and improvements being made on both sides of Mount Vernon Highway. 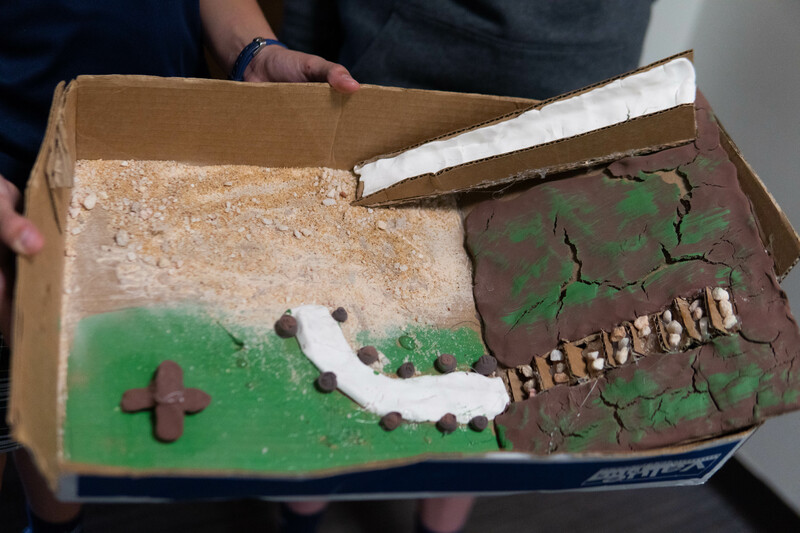 Though this progress brings with it new areas to learn, places to play, and ways to interact with the environment around us – grade 6 students learned first-hand it can also bring flooding, erosion, and impassable areas. During a recent weeks-long project, Susan Oltman’s sixth graders walked the Founders and Glenn campuses to observe the effects of erosion. Their goal was to better understand the process of erosion, then design erosion-prevention rain gardens to conserve soil, clean stormwater runoff, and beautify neglected areas. Using topographical maps, these student scientists explored low-lying areas after heavy rainfall. They discovered several areas that were pooling or collecting stormwater — becoming impassable, and identified trash collecting and flowing against the curb, down the street. Comparing these discoveries to the same areas during dry periods, many students recognized just how difficult it can be to identify problem areas without extensive time in the field. The second half of the project was to create solutions for these problem areas, model them, and present the prototypes. 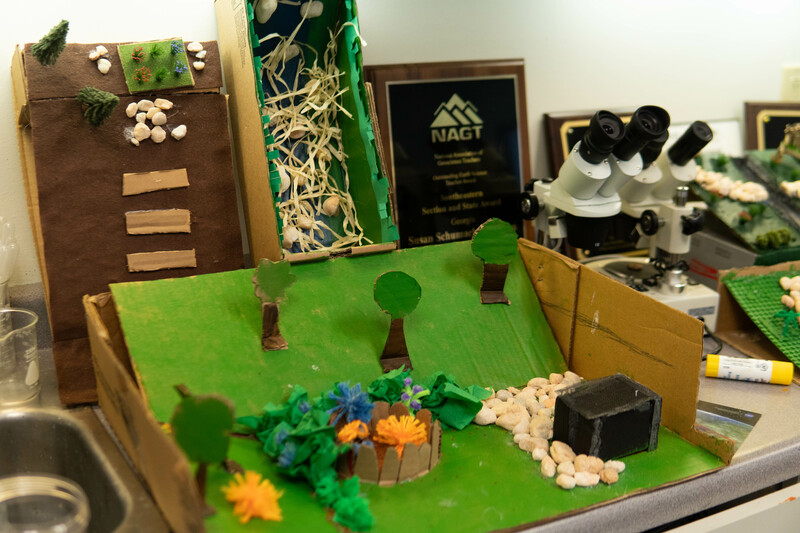 Students researched erosion prevention methods and were shocked to learn how simple some options were, “I didn’t realize that things like flowers could be used,” explained Maya. “And we used stairs to create an intentional flow,” added her project partners Tatum and Lilly (their area of focus was the hill next to the slide on the Frontier). In all, students selected several areas around campus to focus their solutions, including: the blacktop area behind Founders Campus, the area along Mount Vernon Highway between the street and the Activities Building, and the Frontier. Examples of solutions are below. The next step is to pitch the ideas and hopefully see these prototypes become reality at Mount Vernon. How Might We mitigate the effects of stormwater runoff on our school campus? Where are the low lying areas on FC and GC, and how do we identify them on maps? Where does the water go when it rains? How does the land surface* influence stormwater runoff? Why is it important to protect soil and HMW minimize erosion? What materials make an effective rain garden? HMW determine the total cost for our rain garden design? HMW determine the soil quality? What is the water quality of the streams in our watershed? Where are the low lying areas in Sandy Springs?